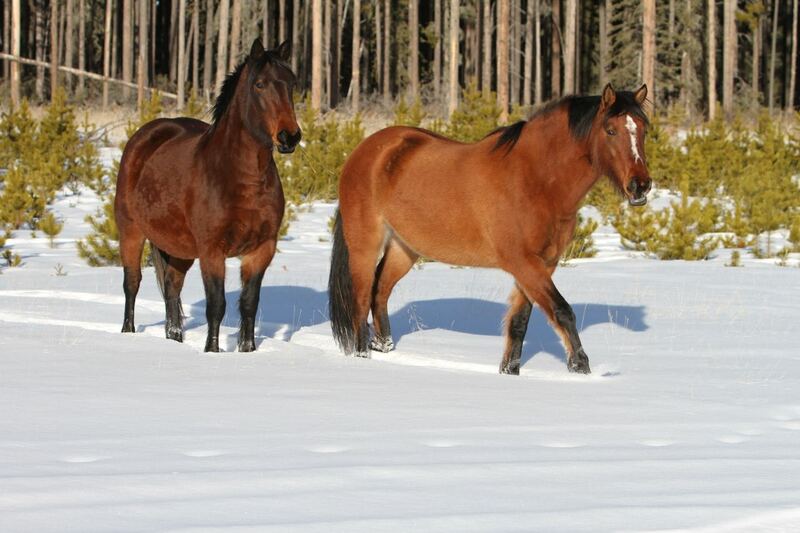 One of the best way to lift one’s spirit on a cold winter day is to travel out west to visit our beautiful Alberta Mountain Horses. We are able to do this a few times a week and so enjoy the time we are able to spend with the horses and other wildlife, observing and photographing them. 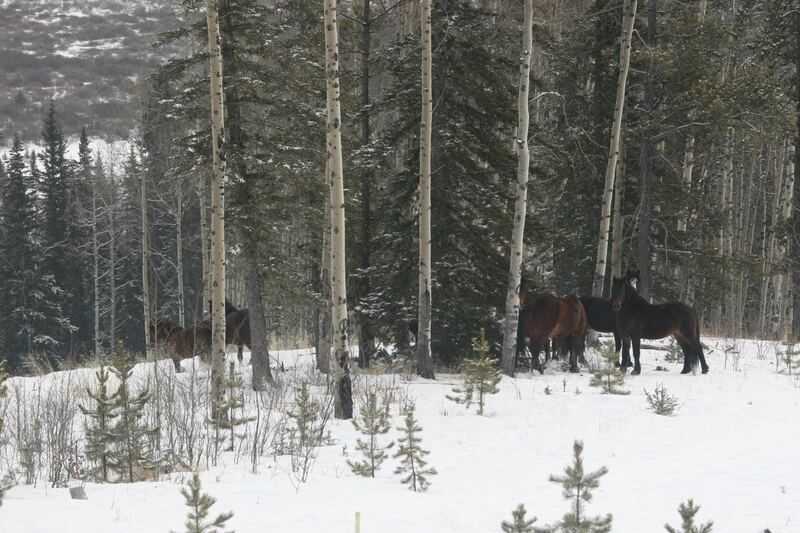 This time of the year we are usually in our vehicle or snowshoeing into out-of-the-way meadows to see which horses may be there. 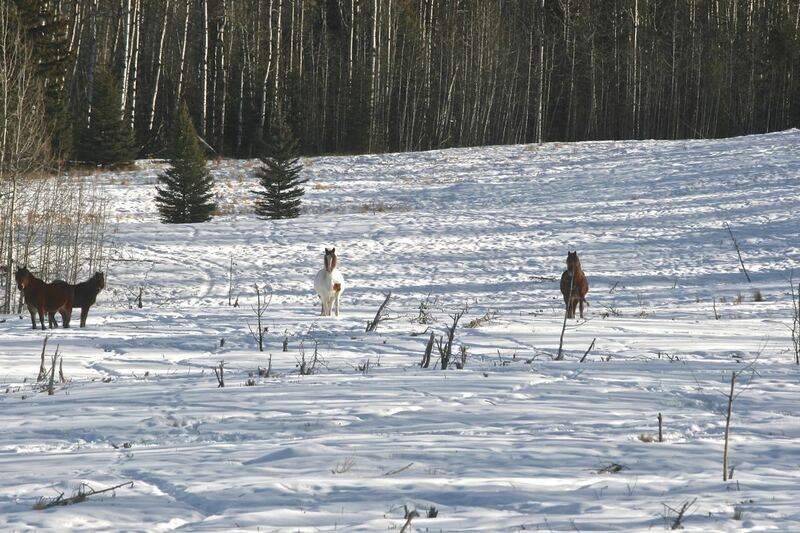 This week we had snowshoed into some large open meadows that were away from any roads. It was here we again found a paint mare that we knew was in the area, but had not seen for over a year. The beautiful mare was with her stallion and one other mare with foal at side. They seemed to wonder what strange creatures we were as we shuffled through the snow. 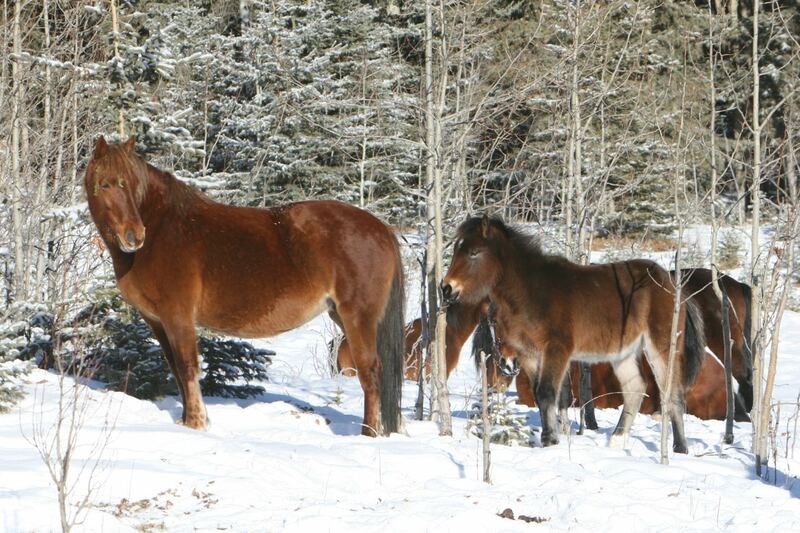 On another day we were exploring back trails and drove into a large clearcut to find a young stud and his mare. The pair were feeding on the grass left exposed from the snow by the young pine trees. They were so curious of us as we stood outside the vehicle taking pictures, that they gave up feeding and approached right up to us. What a beautiful thrill! If it snows, even just a little, we pack up our vehicle and head for the hills. 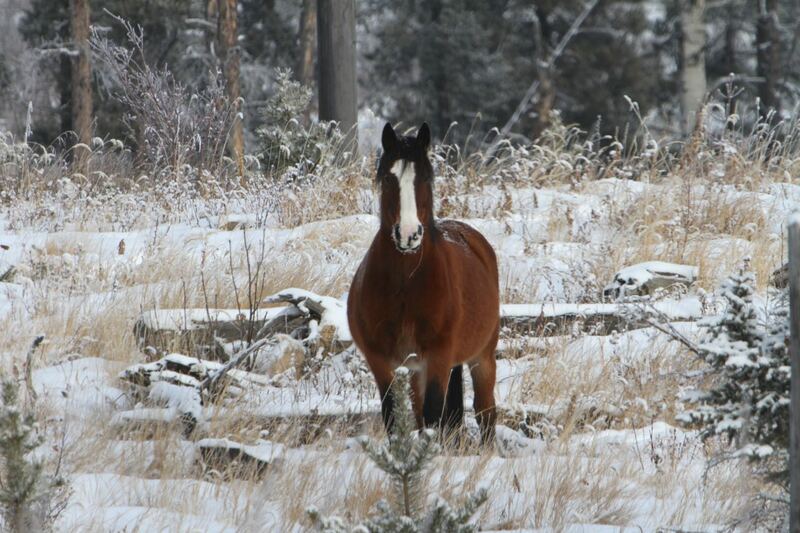 The fresh snow will always tell us many tales of what animals are moving about. 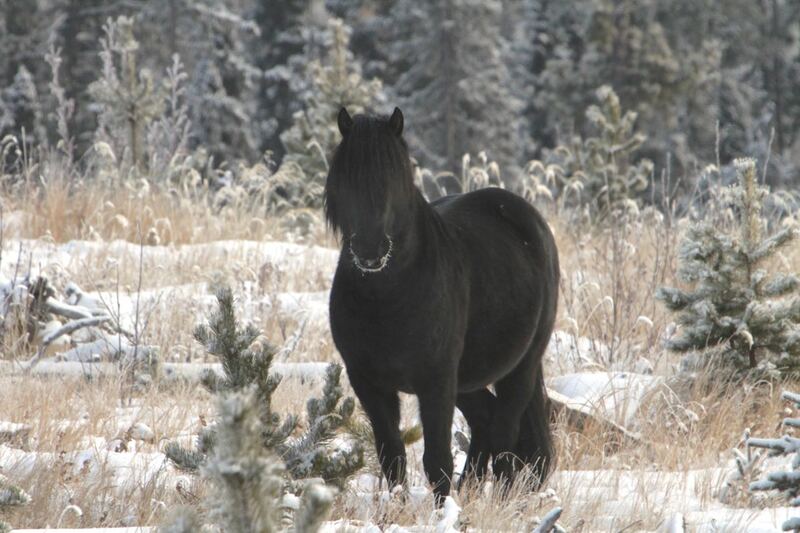 That was the case just the other day where we came across a herd led by a beautiful black stallion. Over the years we have been able to come to know him and his herd very well. We also feel so privileged that they accept us, and allow us to almost mingle into the herd. He is such an impressive specimen – brave, strong and intelligent. That day the snow had just ended as we travelled into their valley. It became immediately obvious of how protective he must be of his herd. Even with us, his demeanour exudes that of confidence. 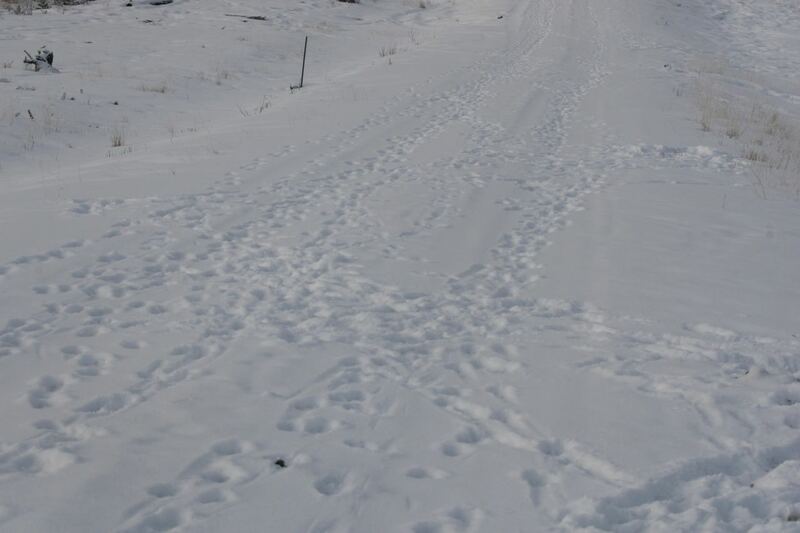 For on the road we found extremely fresh tracks of a pack of wolves probably numbering at least eight. 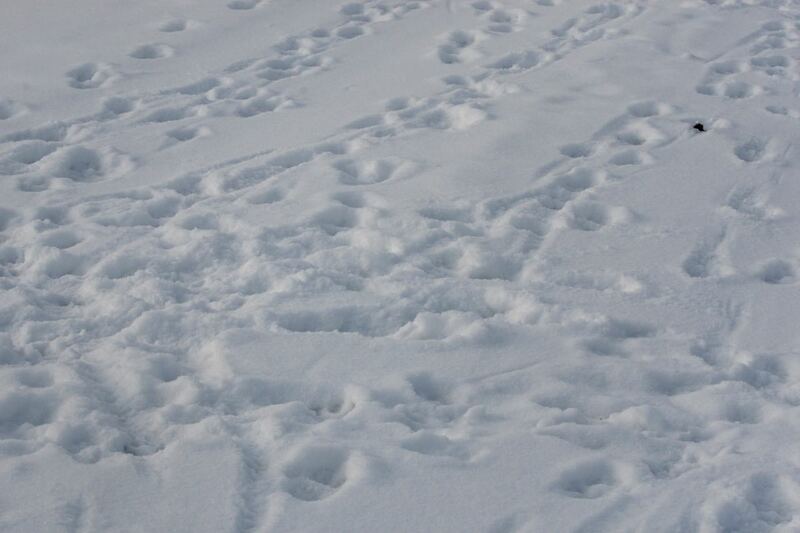 These tracks were right in front of where the stallion’s herd of four mares and a foal were feeding in the meadow. It appeared to us that the pack, who were obviously hunting, gathered together to check out the possibility of their next meal. As we have observed in the past though, the wolves will not challenge a healthy herd stallion. We imagine that they paced about and howled at their plight before they took off down the road to find an easier meal. 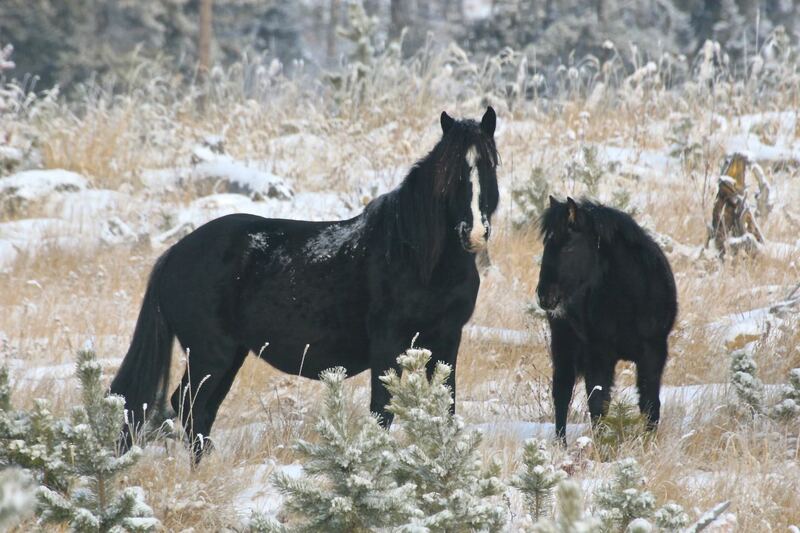 This is a photograph of his black mare and her colt who is definitely taking after his sire. 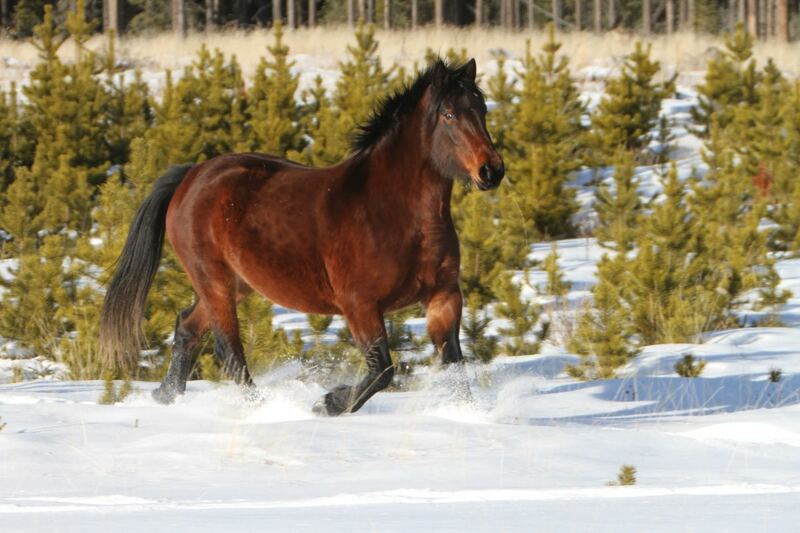 He is a brave little boy and below is his lead mare. 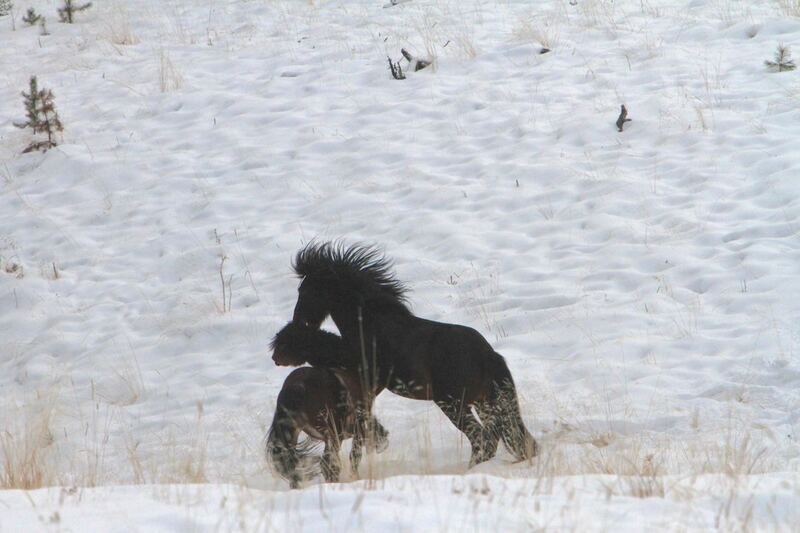 The stability of a herd with a stallion is impressive to witness and still brings a smile to our face. However, it is the hijinks of a band of bachelor studs that can make you laugh at times. Such is the case when we came across a group of bachelors on a pipeline right-of-way. The boys were testing each other out by honing their fighting skills. These two were really going at each other while the others ran around seemingly excited by the antics of this pair. The altercation went on for several minutes as we watched and took pictures. 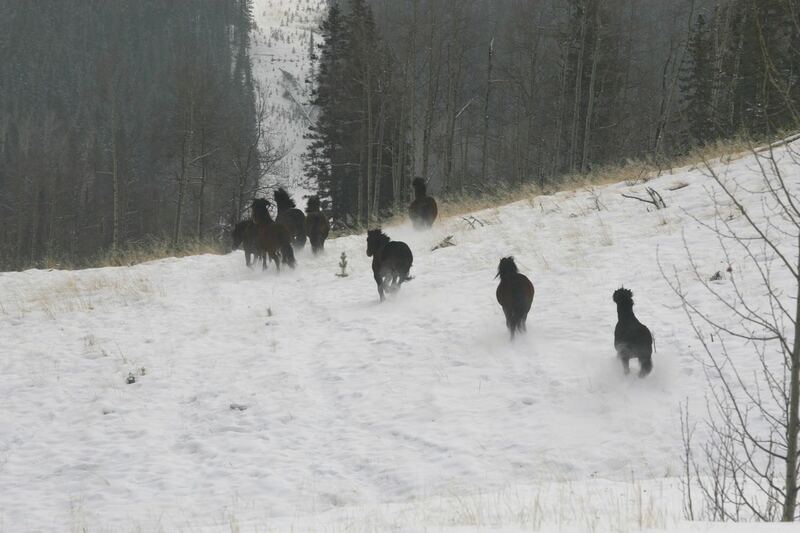 Then all of a sudden we were spotted and off they ran, all of them kicking up their heels and bucking. It appeared that they took great joy and were having fun as they flew through the snow. The group then stopped briefly in a grove of trees maybe to discuss what to do next. Then they were gone again. 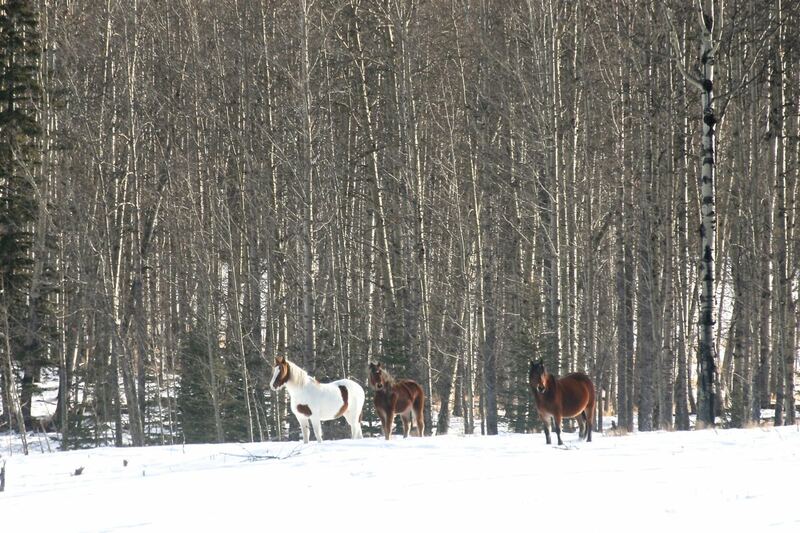 Through our travels it is so good to see that all these horses are in such good condition at this point in the winter. This also holds true for all the other wildlife too that shares this land. It is so wonderful to see all these sites and animals as we travel about.